A few more recipes from my Autumn Harvest Dinner Party to share here. I started out my cooking class with a salad featuring some lettuces and flavors of the season. Figs, cheeses, and pumpkin seeds. These sweet and spicy seeds will also work well using Pecans, Almonds, Walnuts or Cashews (individually or mixed together). I make a sweet, spicy, sugary and salty blend, and I rinse the seeds or nuts under cold water to give them something for the spice blend to adhere. Then I toss the nuts or seeds in a bowl with most of the spice blend, reserving a few tablespoons for later; spread the mixture onto a prepared sheet tray and bake. Easy, less mess and way less calories. These make for a great snack, a topping for salads, a crust on salmon or tilapia or chicken, or as a great food swap item! Mix the the sugar, salt, cinnamon, paprika, cumin and and freshly ground black pepper together in a small mixing bowl. Set 2 tablespoons of the sugar mixture aside. Use a colander or strainer and rinse the pumpkin seeds under cold water and shake off as much water as possible. Toss the seeds in a mixing bowl with the sugar mixture. Spread the seasoned pumpkin seeds onto a sheet tray lined with parchment paper or a Silpat. 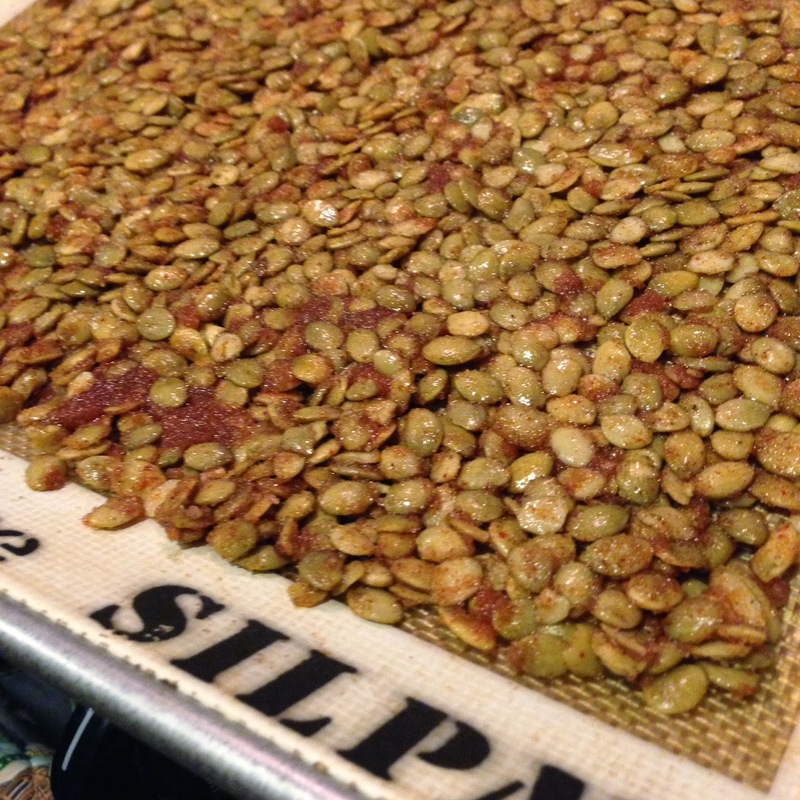 Bake for 10 minutes and then stir the seeds. Bake for another 5 minutes. 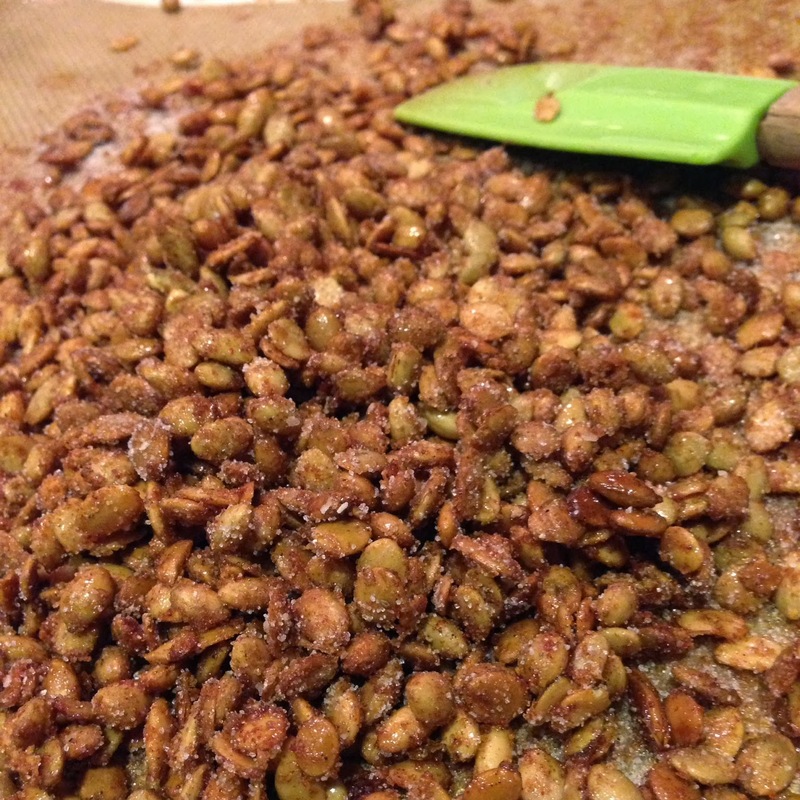 Remove the pumpkin seeds from the oven & sprinkle with the reserved 2 tablespoons of seasoned sugar. As the seeds cool, they will crisp. 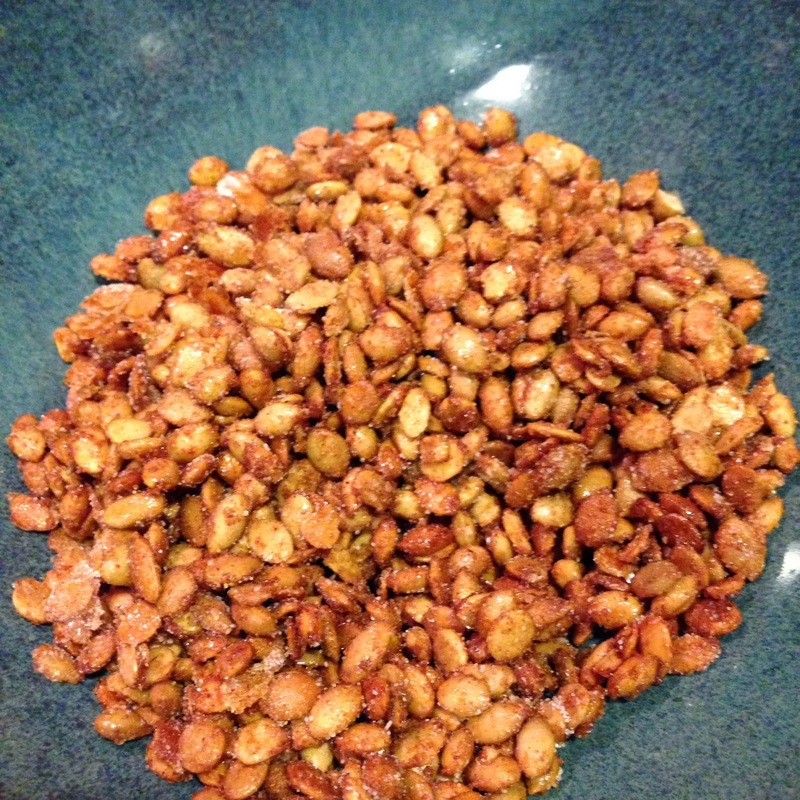 Break apart them apart - the mixture will resemble a nut brittle. Serve at room temperature. Store in an airtight container in a cool place for up to 1 week. These are an old recipe I found in a Donna Hay magazine. I've been using it for years as a go to hors d'oeuvres because it is so easy to put together and has such great impact. Since figs are still in season, I suggest using fresh figs right now. It will work with dried figs as long as they are supple and moist. If the figs are too dry it's like eating shoe leather. 2 Tablespoons Crumbled Bleu Cheese of Choice - Gorgonzola, May Tag Blue, etc. Wash, de-stem and cut the fresh figs in half. Take a small piece of bleu cheese and stuff it into the fresh fig half. Continue doing this until all the figs are stuffed with the cheese. You only want to put in as much cheese as the fig will hold, a bite sized piece. Top the cheese filled fig with either a nut half (or whole almond) or a sprinkle of the sweet and spicy pumpkin seeds (about 4-5 seeds). Drizzle the stuffed figs with a bit of honey. Serve immediately at room temperature. Figs can be stuffed ahead of time and refrigerated - but drizzle honey on them right before serving. Makes 1 dozen - and will serve 6 people (2 halves per person).